Go ahead, dip your toes into one of the most legendary swimming pools in southern California. Join our swim club or rent our private cabana and stay close to the action. Designed by former Tarzan and five-time gold medal winner Johnny Weissmuller in 1946, the pool at The Lafayette has been the scene of unforgettable celebrations for seven decades. 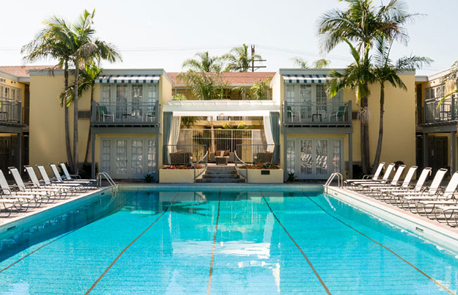 The likes of Ava Gardner and other Hollywood royalty have lounged poolside here and so can you. We welcome locals and guests to unwind and soak up the famed SoCal sun on the daily. Join the Lafayette Hotel Swim Club, then relax and unwind with exclusive events and discounts. The Swim Club is open daily from 7:00 AM to 7:00 PM. Please note there is no lifeguard on duty, and children under 18 must be accompanied by an adult for safety reasons. We also offer discounted group rates for family and friends. Towels are not included in membership. Come experience the hotel's amenities and soak up the sun and the fun for the day. The Day-cation pass helps you keep your wellness goals with access to the fitness center, enjoy a dip in the pool, and receive 15% off food at Hope 46. *Day-cation passes are not available on pool event days. See the Front Desk team for details. Treat your guests to an unforgettable gathering around our famous swimming pool. Whether you choose the spacious cabana or the terrazzo pool deck, cocktails just taste better here. And at nearly 25 meters long and with 300,000 gallons of water, the pool itself can hold quite a few people, too. The only limit on the fun is your imagination. Our semi-private Poolside Cabana is the ultimate indulgence. Not only do you get the best view of our iconic swimming pool and poolside entertainment, but you also can lounge on comfy couches and indulge in tasty fare, too. The Cabana is the perfect base for pool events of up to 30 guests, so grab your favorite swimsuit and let's celebrate. Couches and a coffee table.